I think the main culprit is…the near constant piles of book-like material that I surround myself with. I spent a lot of time in libraries in my youth. (I was also the kid in class that was asking for the book that came with the film-strips in 3rd & 4th grade…Mrs. Kimball knew I'd be raising my hand and always had the book ready for me. Mrs. Frisbee and the Rats of NIMH was my fave!) I think that if you take a wealth of Story, cram enough of it into a young brain and wait…like a pressure cooker…that Story pressure has to go somewhere. Thus, I write. Since grade school and, I am glad to say…I am much better at it now! 2) Tell me about the Hunted Mage Trilogy. Book One: Huntsman is set in ancient Finland and introduces four characters. Eyulf, the student Mage and his fiance' Aila are the most intertwined. Avitus, a displaced Byzantine sailor, and Jaakko, a grieving huntsman (and the title character) have story lines all their own and will slowly become part of the others as the tale unfolds. 3) Where did the story come from? I entered a short story contest in 2005 that I did not win. They wanted a strong female fantasy character and when I wrote the character Miina…well, she never went away. Then I read The Fantasy Novelists Exam and realized how many stereotypical patterns I had read in my years as a fan of the genre. I thought about creating a story that stayed away from tropes and then Miina jumped into the thought and the story grew from there into a Trilogy. 4) Are any characters in your books based on your family? Avitus. My dad passed away at the end of 2009 and that winter I created the character to honor him. He is alive in my head as I write. His mannerisms, description and even some of his phrases make their way into Avitus' scenes almost effortlessly. I was surprised how little re-arranging I had to do to make a space for a new character. It felt like the Story knew he would be along shortly and just waited for me to write him in! 5) What authors and/or books have been your greatest source of inspiration? 6) What are your future projects and/or sequels? I plan to publish Book Two: Dagger by Jan 10th, 2013 and Book Three by the end of June 2013. After that I think I will revisit a few stories I put on hold when The Hunted Mage became all-encompassing. One is an aquatic fantasy, a Watership Down combined with dolphins, whales and other sea-life. The other is a "Stand By Me"-type coming-of-age murder mystery set in the mountains of New Hampshire. But first I plan an Amish Bonnet Romance Zombie novel. A fine upstanding Amish man finds himself shunned when his family discovers his True Love has become a Zombie. Can the young lovers find acceptance from their families before he is eaten? It's anyone's guess! 7) Where can people find you? Here is my Blog. The links to my Kindle, Nook, Smashwords and Createspace sale sites are on the left. I am also on Twitter, Facebook, LinkedIn, and I can be reached via ContactMe! 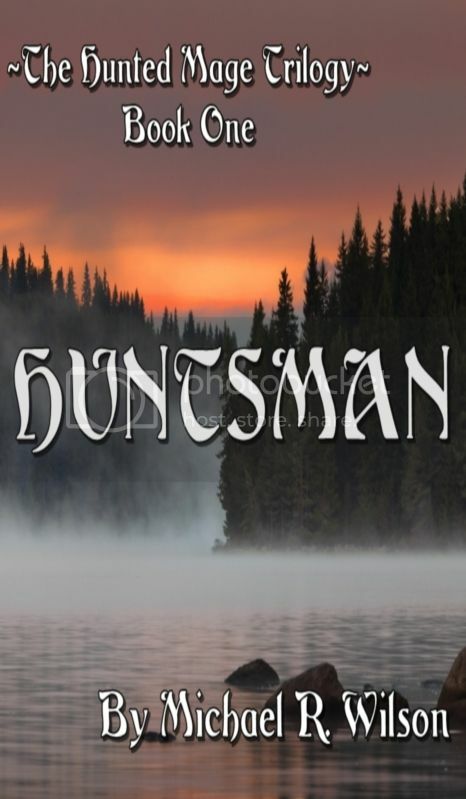 And please…read Huntsman and find me. I'd love to hear your feedback!